A couple of weeks ago I was reading one of my favorites, Cote de Texas, and Joni was writing about Amy Howard. All of the photos were all droolworthy, but I fell in LOVE with this image of Amy's powder room. Guests turn the lion water fountain on by using the floor petal on the ground. (!!!) The countertop normally isn't loaded with wheat grass (this was done for a photo shoot) but how AMAZING does that look?!!!! If I were a super-planner and were having a party -AND had a powder room like this- I would so attempt this. Gorgeousness. Do you have any "dream" images of things that you love that might not be practical on a daily basis but that you'd do for a special event?? So cool! I love it when designers add a little bit of humor to their work. I do wonder if they just have cold water coming out of the fountain or if they came up with a way to balance out cold and hot water lines without a faucet control. That is just fantastic! Very clever and very cool! I want Amy's bathroom! Just bought some wheat grass this weekend already potted up but Dylan dog is doing his best to eat it! DOGS! Lauren- Really unique. I'm drawn to the wall of mirror tiles, with the little jewels of metal holding the tiles to the wall. I have to say Im not a fan of the grass. Looks too forced to be clever. 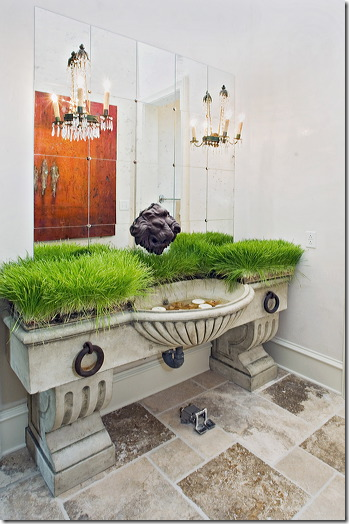 Reminds me of the moss covered mantel at last years DC design house...NOT a good look in my opinion. However the bathroom mirrors, tile and vanity are very beautiful. Lauren on year my home was on a Home tour during the holidays and I filled my black and white bathoom tub up with poinsettias, it was so pretty. The other thing I love is green Pellogrino bottles all lined up in a kitchen, love that look! Lauren - Totally unrelated to your post, but I just had to say that I received my new BHG in the mail tonight. I was so excited as I flipped through before anything else I recognized a pillow in the showhouse & said: "That's Lauren's fabric! I read her blog". The room looked great, love the daybed. This room looks really amazing and wonderful. In any occasion we decorate this room and look elegant. I like this pix so much. Thanks for sharing this post with us.